for college scholarships and coaching education scholarships. Welcome to the second annual ASA Charity Golf Tournament presented by Rated Sports Group. 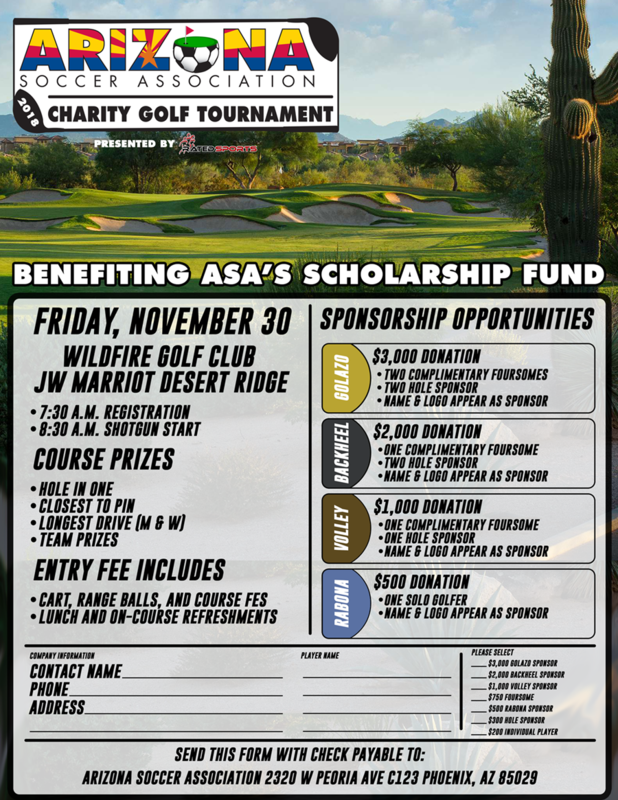 This year's Charity Golf Tournament will support the creation of the ASA Scholarship Fund. If your club registers 6 team in each event the Desert Super Cup (November 23-25) or Phoenix Cup (March 22-24) by October 31, your will receive a FREE foursome! Register here for these events. A silent auction and raffle will also be held during lunch following the golf portion of the event to further contribute to the ASA Scholarship Fund. In a Best Ball tournament, all members of each team play their own balls on each hole. At the completion of the hole, the lowest score among all team members serves as the team score. If there are four members on a team, and on the first hole those four golfers score 4, 7, 6 and 5, the team score is 4, because that is best ball among the four players. If you are unable to attend but would still like to support the event by making a donation please contact Stacey Drinon at (602) 433-9202 Ext 209.